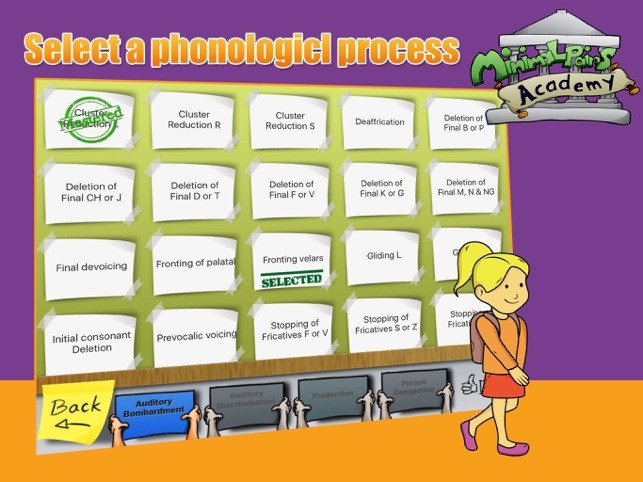 Minimal Pairs Academy targets the 23 most common phonological processes on two activities: auditory discrimination & production. "A minimal pair is a set of words that differ by a single phoneme, whereby that difference is enough to signal a change in meaning." Gierut,2002. 1. 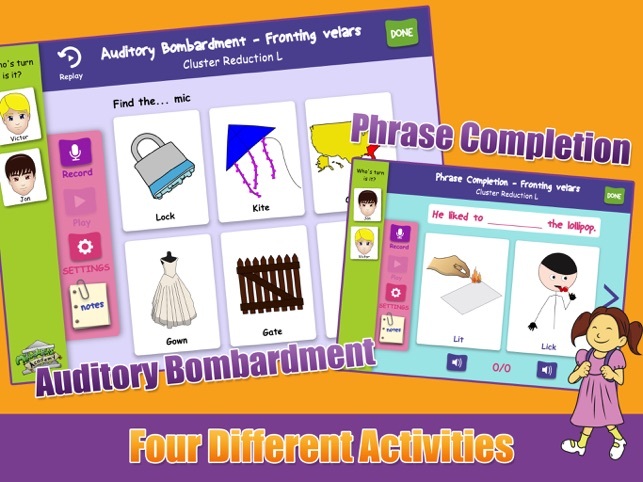 Auditory bombardment: Children are exposed to a variety of words with auditory and visual information about their meaning. 2. 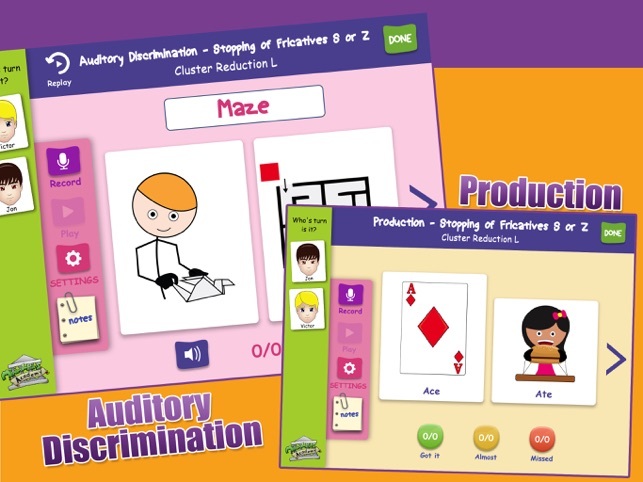 Auditory discrimination: Children must discriminate between sounds when selecting the target word. 3. Production: Children are presented with the target image; speech therapists have the option to display the pair in case children have difficulty producing the target word. 4. Phrase completion: Children are presented with a phrase, which they must choose a target image to complete the phrase. 3. Overall student statistics such as time in therapy, age, processes worked on and mastered. 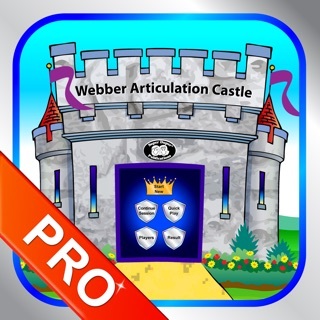 Yes, this application is by far the most complete minimal pairs application on the app store. 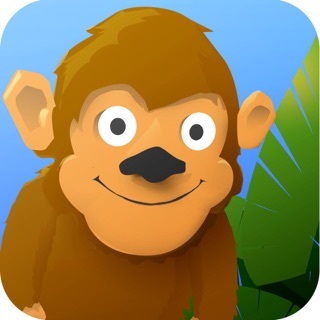 Smarty Ears is a member of Moms with Apps, a collaborative group of family-friendly developers seeking to promote quality apps for kids and families. 3. Saben & Ingham (1991) The Effects of Minimal Pairs Treatment on the Speech. Sound Production of Two Children With Phonologic Disorders. American Speech-Language-Hearing Association. 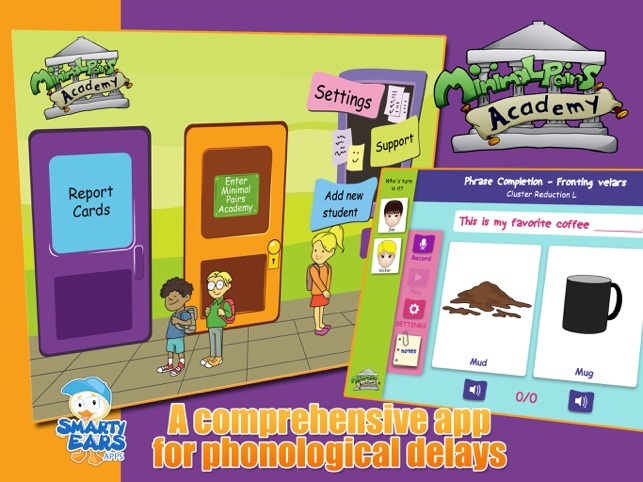 This is a great comprehensive minimal pairs app to work on phonological processes. Great way to keep track of students' goals and progress. The design is cute and kid friendly (at the beginning of app you tap on the door that says "Enter Minimal Pairs Academy" and the students walk in! You can run group sessions with different goals. I like this app because after you master a goal for a student you can go back to their profile and it will show mastered (you tap the goal until it puts a mastered stamp on it). You can choose a photo or an avatar to represent the students (my students love picking their avatars!). 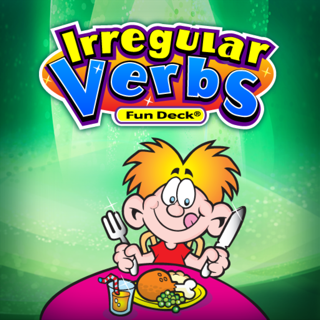 This minimal pairs app is unique from others because it has 4 levels of play (auditory bombard., auditory discrim, production, phrase completion) Also the correct target is on a larger card for more reinforcement. Many options in the settings. 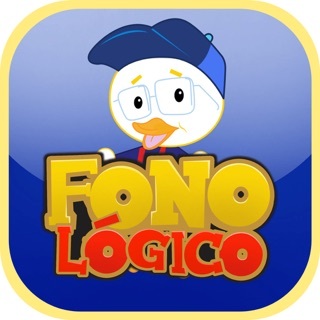 You won't be dissappointed with this app! Good access to pictures but can be cumbersome to use. 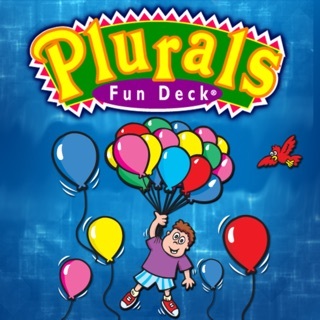 I am very pleased to have access to minimal pairs on my iPad and not have to carry around many different packs of cards (I work itinerantly as an SLP). I like most of the word pairings and pictures, though some pictures are hard to grasp for my 3-5 year olds. I do find it difficult to adjust to my needs and would like to see an option for a different interface where you can simply pick the deck you want to practice, the game to be played, and the child(ren) who will be participating. - finally minimal pairs on my iPad! - only requests the target sound during auditory discrimination tasks, not both to see how well a student can identify either.